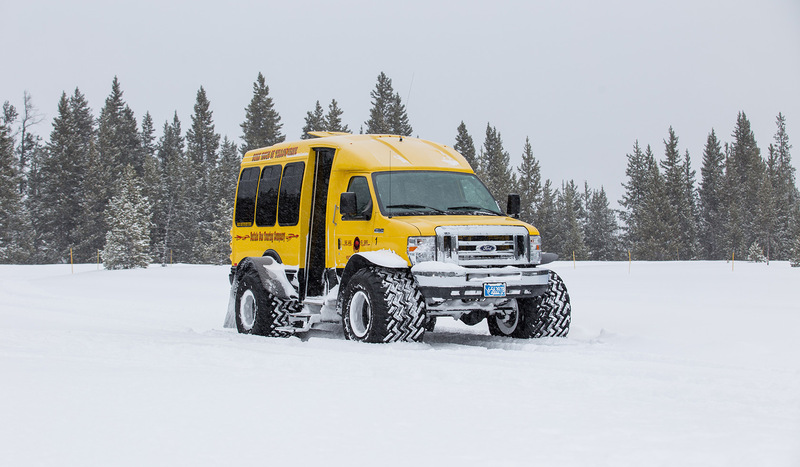 Last winter, we featured a story about The Buffalo Bus Touring Company of West Yellowstone, Montana, putting Alliance flotation tires to the test on their winter tours of the United States’ first national park. Since that time, the tour company has come under new ownership, and we are excited to hear that the new operator had great things to say about how our tires were working for him. This past winter, The Buffalo Bus Touring Company equipped half of its fleet—three 13-passenger vans and one 28-passenger van—with Alliance 381 and Alliance 382 flotation radials. The other vehicles in the fleet are running on rubber tracks. What Operations Manager Erik Dawkins is discovering is that, in many ways, Alliance tires outperform tracks. In a tourism-driven business that thrives solely on providing a positive customer experience, Dawkins says that his passengers love the “soft, bouncy ride, similar to a Cadillac” of Alliance tires. When compared to the “rougher, more rattly ride like a wagon” produced by rubber tracks, its clear that Alliance tires give Dawkins’ visitors the best ride possible as they take in the otherworldly wonders of the park. The softer, less-jarring ride is also great for the operators themselves. Dawkins says that the buses are often traveling up to 80 miles a day; over the course of the entire winter, the softer ride helps reduce operator fatigue, keeping the bus drivers at the top of their game. Furthermore, less rattling means less wear and fewer mechanical issues, keeping the buses on the road and getting as many people into the park as possible (and helping keep Buffalo Bus Touring Company profitable). In addition to the improved ride quality, the tires are also significantly quieter than their track counterparts—making for a more positive visitor experience and reducing the chances of frightening wildlife. A quick scan through The Buffalo Bus Tour’s Trip Advisor reviews highlights their customers’ affection for our tires. Though Alliance 381 and 382 flotation tires weren’t purpose-built with winter tours of the nation’s national parks in mind, we are always excited to discover new and unique markets to serve. Whether it’s in the South’s fruit orchards, the loamy fields of the Midwest, the parched caliche clays of Arizona’s cotton fields, or (apparently) the winter landscape of Yellowstone National Park, Alliance farm tires are there to help make operations more productive, efficient, and cost effective. If Alliance flotation tires can have this big of an impact on something like winter bus tours, think of the results you’ll see when they are applied to the farm! Contact your Alliance Tire dealer today to learn more about our flotation tires.